Sensitive teeth occur when the underlying layer of your teeth, the dentin, becomes exposed as a result of receding gum tissue (the protective blanket that covers the tooth roots). The roots, which are not covered by hard enamel, contain thousands of tiny tubules leading to the tooth's nerve center (the pulp). These dentinal tubules (or channels) allow the stimuli, for example, hot, cold, or sweet substances to reach the nerve in your tooth, which results in the pain you feel. 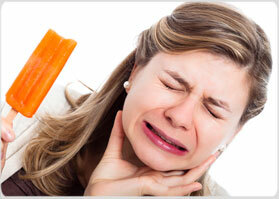 Decay, cracked teeth and plaque buildup can also cause sensitivity. The office of Dr. Grant employs a large variety of treatment modalities to effectively treat this condition. These range from the application of desensitizing solutions and bonded bases to the placement of restorations to seal the exposed areas. No longer should you shy away from certain foods. You deserve to enjoy your meals.